Will Toledo hit the indie rock lottery one Monday last February. Chris Lombardi, founder of legendary independent label Matador Records, rang him up wanting to know more about the 11 albums the 21-year-old Toledo had published online in near anonymity since he was a teen. Lombardi had followed a tip to the Bandcamp page for Toledo’s recordings under the moniker Car Seat Headrest. There’s nothing remotely unusual about getting a link to a Bandcamp profile; since launching in 2007 Bandcamp has become a repository for the hopes and dreams of unsigned artists. Toledo grew up alongside Bandcamp. He started writing and uploading records to the service as a teenager at home, and continued to churn out music online as a student at William and Mary in Virginia. By the time Lombardi got to Toledo, he was living in Seattle with 11 (ELEVEN!) albums on his page. Most of that music had been recorded in Garage Band on a MacBook, using only the computer’s built-in microphone to capture anything acoustic and a little USB interface to plug in his electric guitar. The seemingly random name for the band stems from Toledo’s years of recording music in his parent’s house. When it came time to record vocals, the self-conscious teen would take the family minivan out to an empty parking lot where he could sing the songs into his computer in relative peace. From there, he would tweak the songs until they were ready and dump the records onto Bandcamp to be discovered–or as it was for years, not discovered–by the internet underground. Bandcamp has been around for going on 10 years, and indeed, its design makes it relatively easy for an artist that doesn’t have a record deal or much of a career to have an “album” people can access. Toledo’s not the first accomplished artist to tread this territory. In fact, he first became aware of the service after reading about the success the New York indie band Cults had with it. After being discovered on Bandcamp, Cults have released two records which both charted in the top 200. More recently, Toledo’s contemporary Alex G released his first record on Domino Records after uploading loads of material on Bandcamp. As a generation reared on Bandcamp comes of age, it’s possible we’re entering the era of the Bandcamp prodigy. Toledo is slim built with a mop of black hair that looks like a wig that’s slightly too big for his head. He speaks in a low monotone voice from behind a pair of boxy glasses. Toledo’s Bandcamp is an impressive archive of material, and there’s no great way to plow through the whole thing efficiently. The closest experience I’ve had is trying to mow down everything Neil Young recorded over 30 years. And remember, Toledo’s oeuvre spans only about five. As you would expect, the music is all over the place, from some eccentric variations on introspective folk to big jangly rocks songs to low-fi powerpop. Matador’s Lombardi says he recognized similarities between Toledo’s eccentric, super-prolific style and the long career of amazing rock n’ roll weirdo Robert Pollard of Guided By Voices. When Matador signed Pollard back in the 90s, he was just an Ohio guy making beautiful art that almost nobody was paying attention to. As with Pollard’s GBV, Lombardi couldn’t believe what he’d found in Car Seat Headrest—not only was Toledo a free agent, but nobody had written a word about him. Lombardi didn’t waste any time. 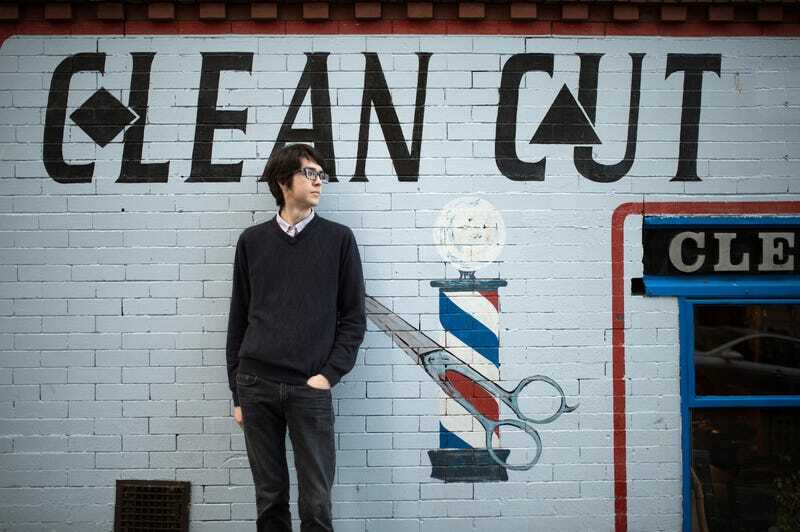 He flew to Seattle from Los Angeles for a Car Seat Headrest show the same week he heard the songs on Bandcamp, and offered him a record label contract the next day. Getting signed to a label like Matador exposes you to thousands, if not millions, of people who never would’ve heard your music before, so before releasing a new record on the label, Toledo went back and rerecorded an album’s worth of material from his Bandcamp days. Released last week, Teens of Style was conceived as a way to introduce new listeners to Toledo’s massive catalog. To “clear the weeds,” as Toledo puts it. Toledo is already done with a full-length follow up called Teens of Denial, set for release next year. For the first time, he went into the studio with a full band and completely written songs. He worked with a professional producer, Steve Fisk. Toledo’s no longer at home, and recording costs real money and the time of lots of other people, which has forced him to abandon much of his old song writing style.